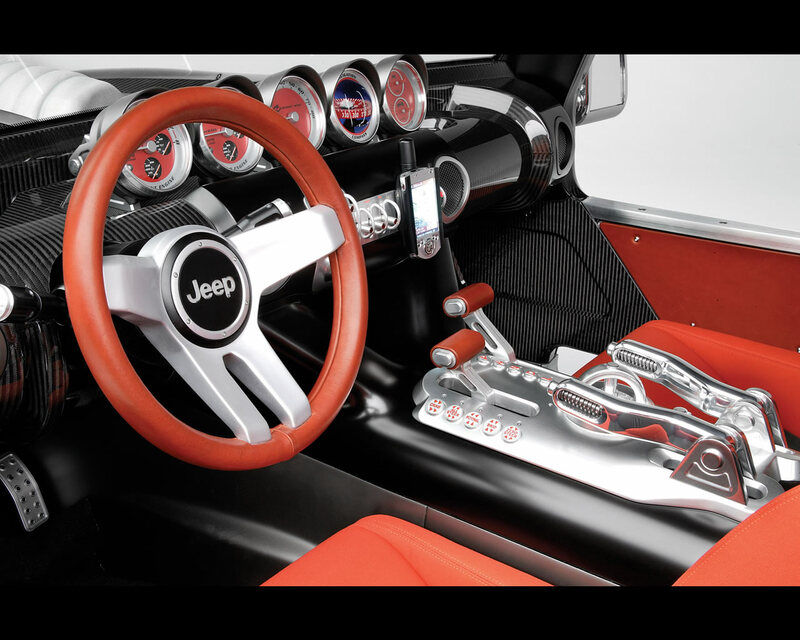 On occasion of the 2005 North American International Auto Show, the Chrysler Group's Jeep introduced the show-stopping concept Hurricane with two 5,7 liter Hemi engines and four wheel steering architecture. " The Jeep Hurricane is simply the most maneuverable, most capable and most powerful 4X4 ever built," said Trevor Creed, Senior Vice President, Chrysler group Design. " 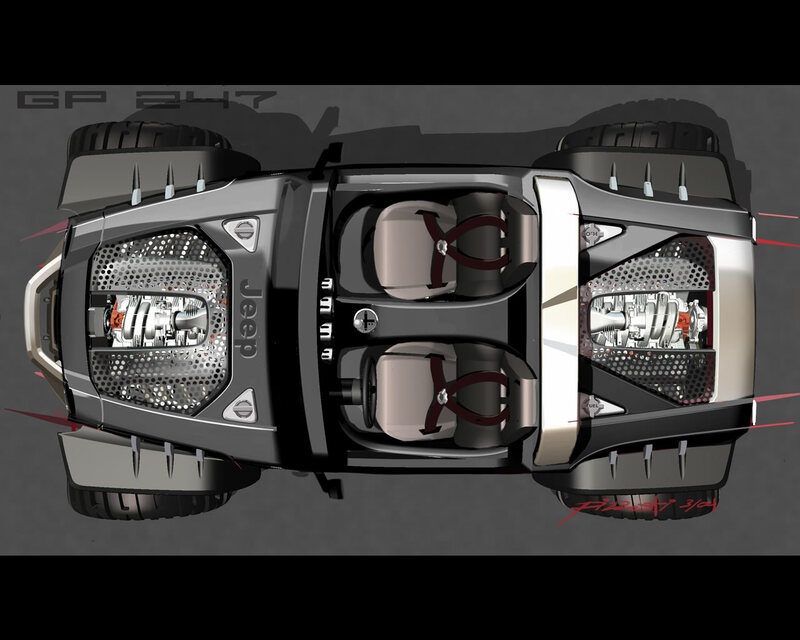 It pays homage to the extreme enthusiast's Jeep vehicles in form and off-road capability, but is a unique interpretation of Jeep design. Simply stated, it is the extreme example for Jeep brand." There are two 5,7 liter HEMI engines in the vehicle: one in the front and one in the back. Both engines deliver 335 hp and 370 lb-ft (501 Nm) of torque- a total of 670 hp and 740 lb-ft (1.003 Nm) of torque. The Jeep Hurricane is equipped with the Chrysler Group Multi-Displacement System (MDS). 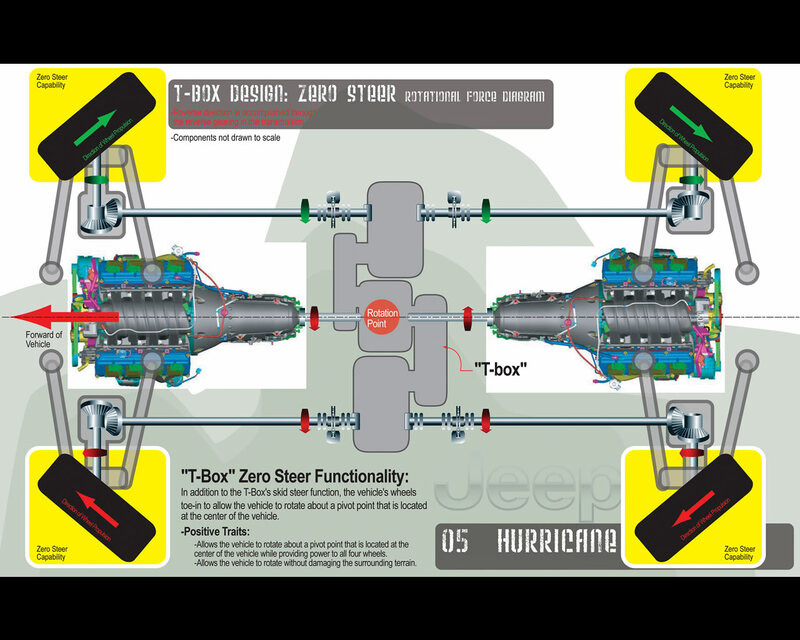 Depending on the driver's needs, the Hurricane can be powered by 4-, 8-, 12- or 16 cylinders. All of that translates into buckets of torque for climbing obstacles other 4x4 vehicles can not even pretend. In addition, it has the power and traction to move from zero to 60 mph (96 kph) in less than five seconds. The power is delivered through a central transfer case and split axles with a mechanically controlled four-wheel torque distribution system. The front and rear suspension is short/long arm independent with 20 inches (508 mm) of suspension travel, controlled by coil-over-shocks with remote reservoirs. The vehicle has 14,3 inches (363 mm ) of ground clearance, and incredible approach/departure angles pf 64.0/86.7 degrees. these are nearly vertical angles - combined with 37 inch tall tires, so the Hurricane won't meet much that it cannot climb. 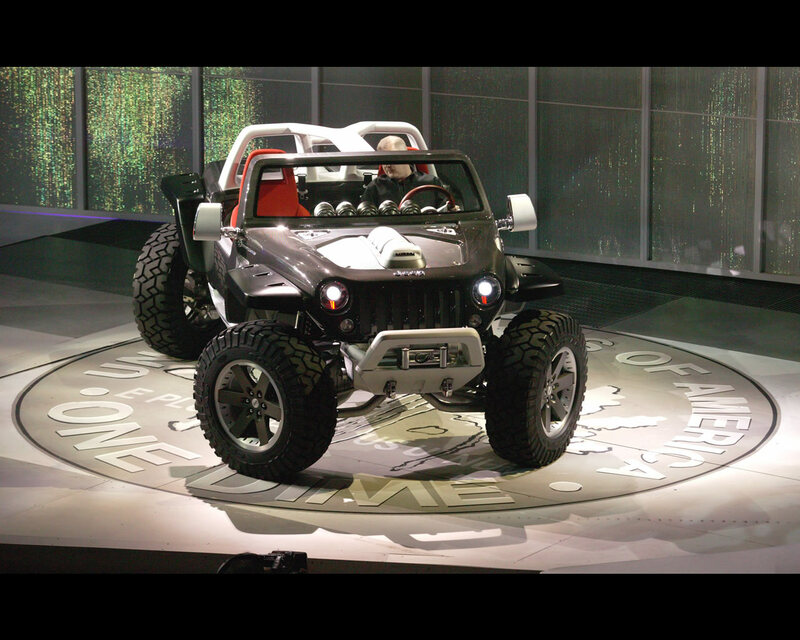 The Jeep Hurricane was the only vehicle on the auto-show circuit that provides its own turnable feature. The vehicle features a turn radius of absolutely zero, thanks to skid steer capability and toe steer: the ability to turn both front and rear tires inward. 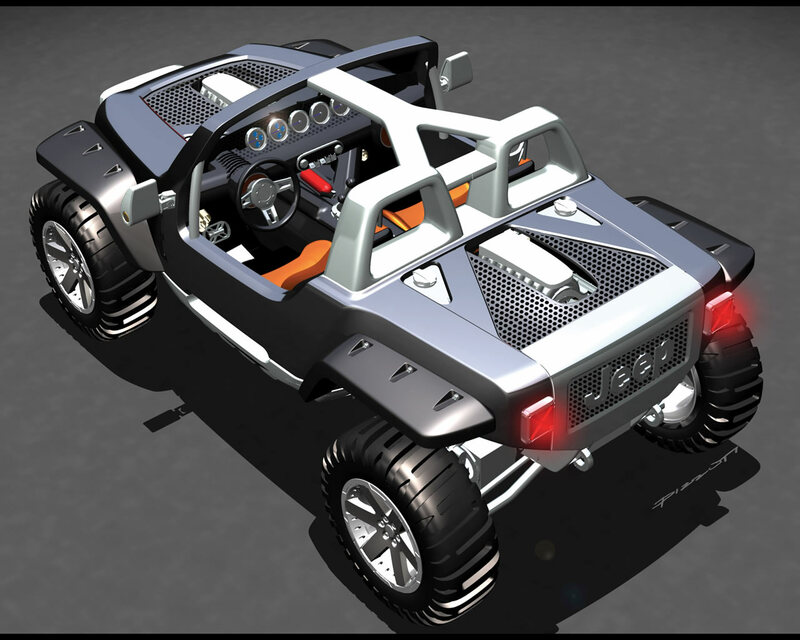 In addition, the vehicle features two modes of automated four-wheel steering. The first is the traditional with the rear tires turning in the opposite direction of the front to reduce turning circle. The second mode is an innovation targeted to off-road drivers: the vehicle can turn all four wheels in the same direction for nimble crab steering. This allows the vehicle to move sideways without changing the direction the vehicle is pointing. "Out in the wilderness, changing direction in minimal space can mean the difference between an afternoon of adventure and a distress call back to the trailhead," Creed said. 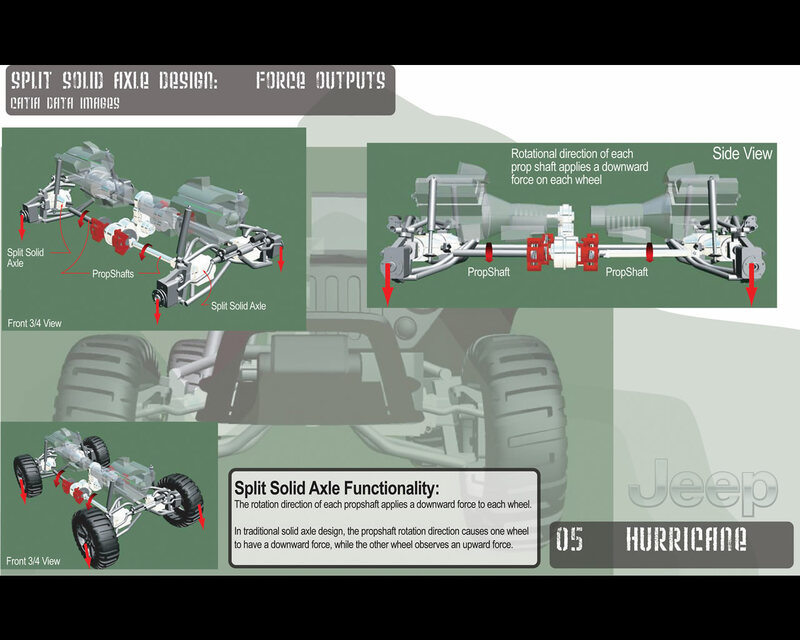 "The multi-mode four wheel steering system on the Jeep Hurricane is designed to offer the enthusiasts the next level of performance and unexpected maneuverability." 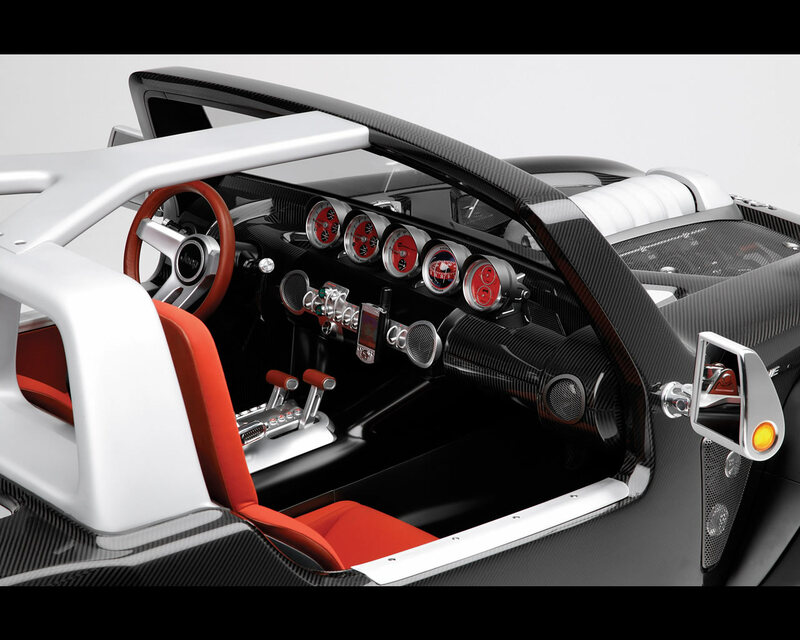 The one piece body is shaped of structural carbon fibre, and forms the chassis that would be offered through a traditional frame. 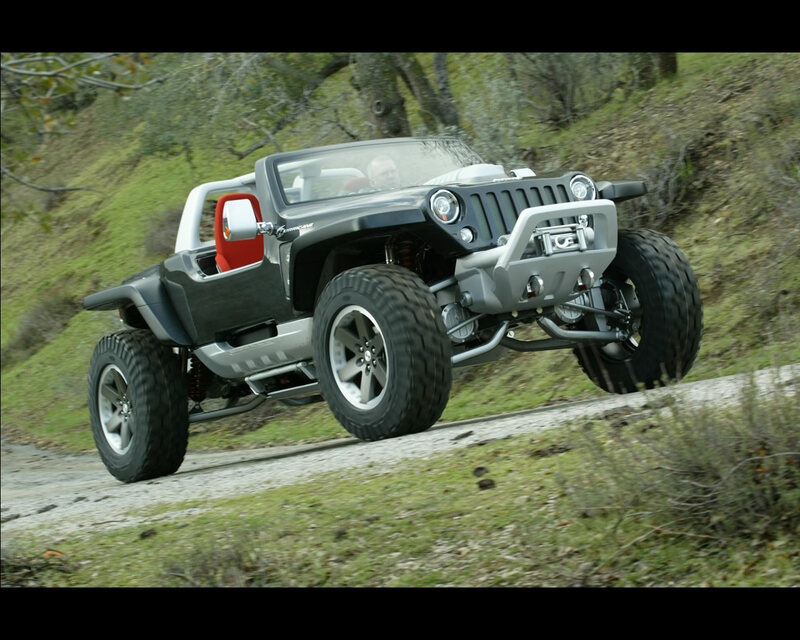 The suspension and powertrain are mounted directly to the body. An aluminium spine turns under the body to both connect the underside and to function as a complete skid plate system. The design is lightweight with high strength, and it boasts functional appearance. Dimensions: weight (estimated) 3.850 lbs. ( 1.746 kg), length 151,8 inches ( 3.856 mm), wheelbase 108,1 inches (2.746 mm), front overhang 25,0 inches ( 635 mm), rear overhang 18,7 inches (475 mm), width 80,0 inches (2.033 mm), Height 68,2 inches (1.732 mm).